The beloved director of some of the best horror and thriller films of all time is transformed into one of his own off-balanced creations in The Girl, which follows Hitch (Toby Jones) and Hedren (Sienna Miller) as they collaborate together on The Birds (1963) and Marnie (1964). Plucked from the commercial world and groomed by Hitchcock to become a movie star, Hedren gave herself over completely to Hollywood’s top director. She had little choice — with so much power in the industry, the only way Hedren would have a fruitful career as an actress would be to follow Hitch’s every word. But the film suggests Hitchcock’s direction wasn’t limited to Hedren’s on-screen work — demands of intimacy and a sadistic sense of entitlement entangled Hedren in a web of harassment. Her inability to serve the director would shatter both of their lives. Film buffs hold Hitchcock on a high pedestal, but The Girl has no qualms exploring the dark side of his personality and that’s where the film shines brightest. Like other behind-the-scenes dramas, The Girl spends introductory time indulging on the glamor of watching Hitchcock work from behind the camera. Old school Hollywood glistens with period production design, from the expansive backlot to recreations of scenes from The Birds. But director Julian Jarrold (Brideshead Revisited, Red Riding: 1974) and writer Gwyneth Hughes (BBC’s outstanding mini-series Five Days) wisely drop the nostalgia in favor of the complex and terrifying relationship between Hitch and Hedren. When Hitchcock shoots 45 takes of The Birds‘ famous attic sequence, he’s not doing it to perfect the shot — he’s torturing Hedren. 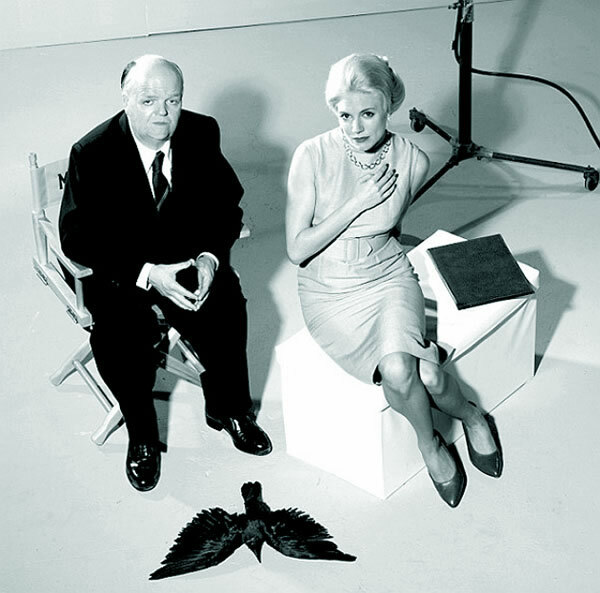 Only before she enters the set for the first time is Hedren alerted that Hitchcock has planned to shoot the scene with real birds. Hedren complies, knowing she can’t bail from the picture and wanting to stand up against her off-screen ruffian. With each take, the birds talons slice her face and break her will. Hitchcock watches with an unflinching gaze. Toby Jones is astounding as Hitchcock, conjuring up the charm on the surface and unearthing Hitchcock’s twisted center that would occasionally bubble to the top. Jones’ Hitch is plagued by his physical insecurities and, in turn, capitalizes on his clout to muscle others. The actor disappears into Hitchcock’s voice and mannerisms, but they’re never prohibitive of Jones layered performance. Miller, who has been out of the spotlight for a few years, plays Hedren like one of the blonde bombshells that would turn up in the Hitchcock’s own films. Hedren’s not fleshed out like Hitchcock, but Miller bounces back and forth gracefully from the smiley persona of a professional actress to the emotionally distraught women that emerged whenever Hedren made it home. Like the victims in Compliance, another 2012 film about the frightening power of persuasion, the words of Hitchcock boil in Hedren’s mind, making Miller’s role mostly silent but always engrossing. Adding to the complexity is Imelda Staunton as Hitchcock’s wife Alma. She’s commanding as Hitch’s persuasive partner and involving her more in the film would have helped make the central duo’s battle become even deadlier. One might expect The Girl, with its horror film undertones, to play out in the style of a Hitchcock classic. Thankfully, Jarrold strays away from mimicking the great director’s tropes, sparsely alluding to famous iconography (it’s hard not to when Hitchclock climbs a set of winding stairs or Hedren washes herself in the shower). References don’t clog up the picture, only send chills down the spine. For the most part, Jarrold keeps the flashy camerawork to a minimum, allowing his two leads to play. Occassionaly The Girl meanders away from the central duo does it slow down — as anyone who works on movies will tell you, watching them be made isn’t all that interesting — but the core relationship is effectively presented (if not as dark and twisted as it could be). Hedren wasn’t just the victim of Hitchcock’s on-screen orchestrations — she was the victim of the director himself. The Girl airs on HBO on Oct. 20.